I've been a fan of Pastor Rick Warren of Saddleback Church for a number of years. His book A Purpose Driven Life guided my post-graduate degree decisions back in 2003. So when I found out he was publishing a "40 days to healthier living" book, I ordered it so I could continue to grow both spiritually and healthy. Being a Registered Dietitian, I have a weakness for these types of books, my shelves are cluttered with them. When it arrived, I of course went first to the "Foods to Lose" chapter which I opened with trepidation because I truly wondered which foods readers were going to be advised to "lose". and indeed, it was over for The Daniel Plan. Here is why professionally as a farmer and an RD, I'm returning The Daniel Plan. "The heirloom biblical wheat of our ancestors is something modern humans never eat. Instead, we eat dwarf wheat, the product of genetic manipulation and hybridization, that created short, stubby, hardy, high-yielding wheat plants with much higher amounts of starch and gluten." 1. USDA researcher Donald Karsada published in the Journal of Agricultural and Food Chemistry and analysis of historical wheat protein data which show that there has been no significant increase in wheat gluten.His research publication is linked here: Can an Increase in Celiac Disease Be Attributed to an Increase in the Gluten Content of Wheat as a Consequence of Wheat Breeding? Since 1925 to current data, wheat protein has averaged 10-18%. 2. USDA's National Small Grains Collection reports that both heirloom and modern wheat varieties have straw lengths ranging between 12" and 60" in length. Some other facts about wheat, wheat intake, and gluten:. 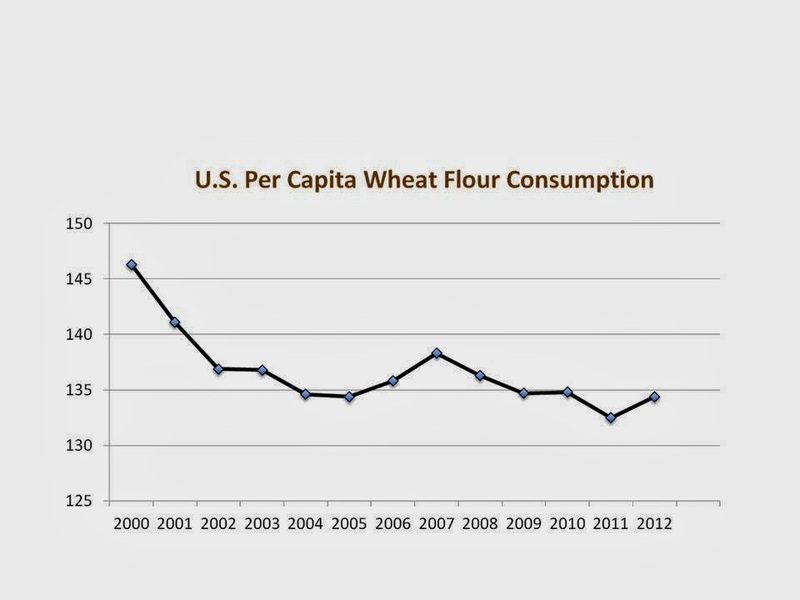 In fact wheat consumption has declined from 2000 to 2012. In addition, the premise that wheat consumption has contributed to obesity is also flawed. 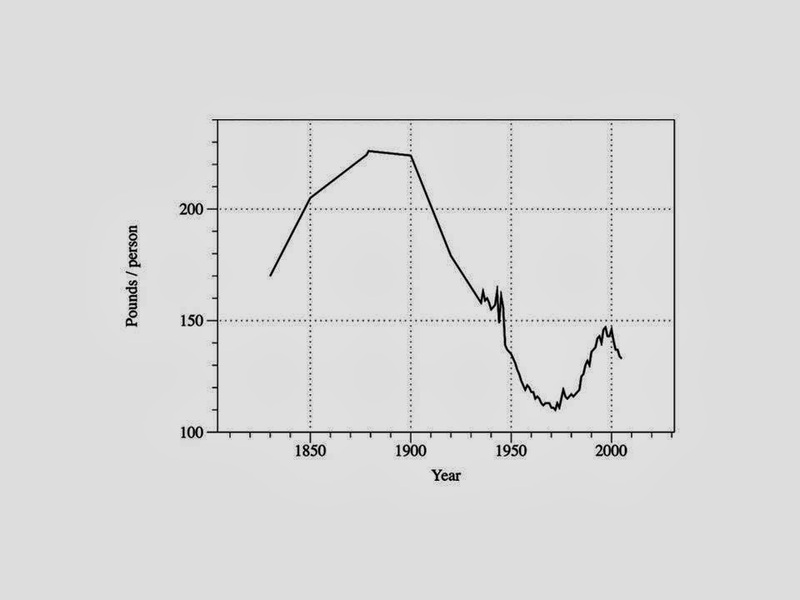 The table below shows peak wheat consumption in the late 1800s, when, if wheat caused obesity, we would have been at our heaviest. Source: Kasarda DD J Agric Food Chem. 2013 Feb 13;61(6):1155-9. So what's the real cause of our obesity crisis? Calories! We're eating over 600 calories a day more than we were 4 decades ago! 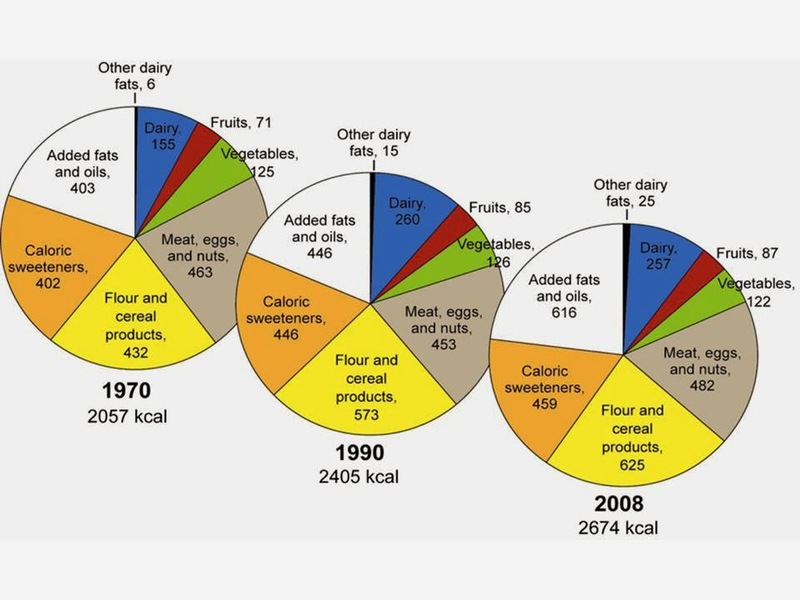 So look again, the first chart is USDA data showing the decline of wheat consumption and the 3rd chart is showing increasing calories since 1970. Still think its wheat? Research shows whole grains have been associated with lower abdominal fat. 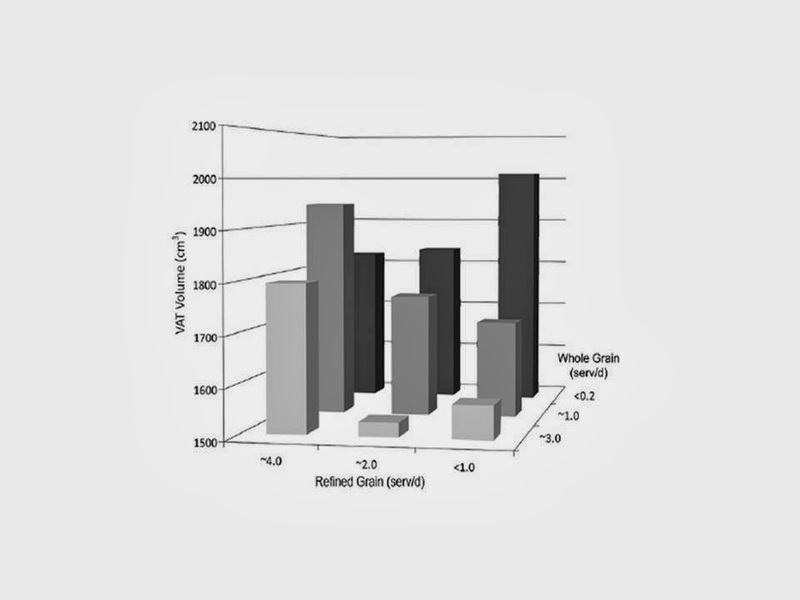 The Framingham Heart Study (n=2834) compared visceral adipose tissue (VAT) to whole grain consumption and found that whole grain consumption lowered the amount of visceral fat. Visceral fat is the "cushion" around your vital organs but also is the fat that accumulates in excess in your abdominal area (think apple versus pear shaped). So think about the difference between whole grain and refined grain products. The difference in refining isn't changing the gluten in the wheat, it is changing the fiber content, while the processing into cookies, donuts, etc... adds fat and calories. The lowest visceral fat noted in the front center column are those people who at 2 enriched and 3 whole grains daily. "The dwarf wheat grown in the United States has changed the quality and type of gluten protein in wheat, creating much higher gluten content, and creating a super-gluten that causes celiac disease and autoimmune antibodies." I was done. I closed the book and was so utterly disappointed that Pastor Warren would associate himself with such misguided medical information. i couldn't even read the rest of the book. Chapter 4 closed the book for me because of a simple but very wrong medical statement. I GET that he wants his congregation and himself to get healthy. I applaud their success and their efforts BUT hear me when I say GLUTEN DOESN'T CAUSE CELIAC DISEASE! The National Institutes of Health - Digestive Diseases Center states that celiac is a genetic autoimmune disease. 97% of people with celiac disease have the HLA-DQ-2 or the HLA-DQ-8 gene which predisposes them to celiac. This does not mean they necessarily develop celiac but usually have some triggering event such as surgery, pregnancy, viral infection, etc... It is detected by a blood test and confirmed by an intestinal biopsy. Less than 1% of the US population has celiac disease. Additionally, there is wheat allergy which less than 1% of people have and gluten sensitivity which afflicts approximately 6% of the population. Different from the many gluten-free fad diets, celiac is a very serious medical condition requiring the elimination of gluten from the diet. But the gluten-free market is a $3 billion food market. Books like The Daniel Plan and others that misrepresent celiac do true disservice to the medical condition. Finally, what is NOT covered in this "Foods to Lose" chapter is the fact that barley, rye, and triticale also contain gluten. One of the chapter's subtitles is "Is Wheat Dangerous? The Problem With Gluten" but then makes NO mention of the other grains with gluten. So is the problem gluten, or is the problem wheat? Because you can't talk about one without the other and then leave out other grains that contain gluten. This type of misinformation does the reader a real disservice. I applaud Pastor Warren and the Saddleback congregation for their weight loss and their efforts to grow healthy and spiritually. We Christians are told in the Book of I Corinthians 6:19 & 20 that our bodies are temples of the Holy Spirit, that we don't own them, that we received them from God and should honor God through how we treat them. Each of our approaches may be different through diet, exercise and other choices we make that honor or dishonor God with the way we use our bodies. But we also honor God with the truth, and the truth is, there are too many factual errors about wheat, gluten and celiac disease in The Daniel Plan. It was truly disappointing for me as a fan of Rick Warren. Biblical Daniel did not give up wheat or other whole grains. He did not go gluten-free. Many thanks to Dr. Julie Miller Jones, PhD, LN, CNS for contributing her assistance and information to this blog.